Oh how I love Wes Anderson. As one of my Hollywood gods (others including P.T. Anderson, Ken Adam) the man has never done me wrong. From "Bottle Rocket", through "Rushmore", in the GLORIOUS "Royal Tenenbaums", continuing in "Life Aquatic", the man has shown me he understands movies, movie making, design, character, story, plot, and above all life and growing up in it. "Darjeeling Limited" continues the Wes Anderson tradition of stories of adults who have never really gotten over their childhood. I'm not going to dwell long on the plot other than to say that there are events that are totally unexpected and tragic, but life affirming at the same time - ie, the movie unfolds much like life. Its a road-movie done Wes Anderson style, just like Life Aquatic was a documentary, and Rushmore a coming-of-age story. Its worth noting that Anderson continues his virtuoso understanding of design in this movie. There is not a single shot that is not laid out perfectly, and some of the images are so stunning that I almost hyper ventilated (and exaggeration, but you know what I mean). A couple of the shots that stick in my mind. One is where Jason Schwartzman's character Jack leans out the window of the train and sees (the BEAUTIFUL) Amara Kara's Rita. The exteriors were shot at night, with minimal lighting. What you see is a perfectly midnight blue sky, with black silhouettes of trees flying by, and only the looks on Jack and Rita's faces to tell the story. Another is during the funeral - a great slo-mo tracking shot that follows the brothers until they get into a car, where it cuts to a different funeral, at a different time. Gorgeous. And the love of design doesn't stop with the shot choices - all kudos go to production designer Mark Friedberg; the costumes, while not being as gaudy as Elizabeth's, are made in beautiful colors and shot with all the vibrancy a camera can muster. Of special note is the luggage each of the boys is carrying - I would love to have any of these pieces. 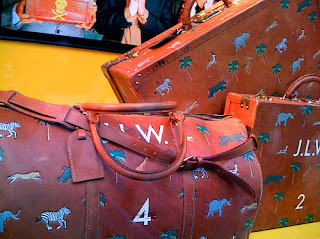 They are Mark Jacobs for Louis Vuitton, but more importantly, they have a jungle design by the directors brother Eric Anderson - who, if you know Wes Anderson films, was responsible for the paintings you see in Royal Tenenbaums. The font used on them is the standard Wes Anderson font as well - a great touch. The last thing I want to comment on is the acting. It is letter perfect - the addition of Adrian Brody to Wes' usual cast added a great element of pathos, Owen Wilson was nicely restrained (and I always like him best in Wes movies), and Jason Schwartzman can do no wrong by me - I've loved him in everything I've ever seen him in (one day I'll do a retro review of Marie Antoinette, one of the most underrated movies in the last 10 years). Irfan Khan is perfect as a distraught father who never gets a single line in English, but who provokes immense sympathy regardless. Waris Ahluwalia, who you might remember from "Life Aquatic", is great as a chief steward that gets fed up with the boys acting like children. Amara Karan, in her first major role, is beautiful, a little naughty, very real, and delivers a wonderful nuanced performance - I hope this film will introduce her to a wider audience, and get her some more work! A special shout out should go to Anjelica Huston and Bill Murrary, who are HUGE actors who play small roles, and in Anjelica's case, very against type. So enough gushing from me. 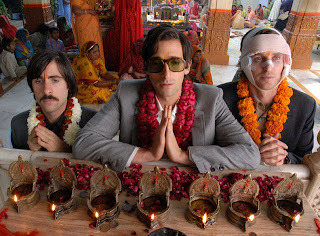 Go see The Darjeeling Limited already.